Why is disruption coming? Joe starts by providing an industry history lesson. He shows how real estate has evolved from a localized, community-driven business where solitary brokers had control to one where powerful agents and agent teams are the central focus of the business. Because of this agent focus, the end user of real estate services, the buying and selling client, is being ignored., the end user of real estate services, the buying and selling client, is being ignored. The real estate sales process is being enhanced and optimized to service the agent, not the client. 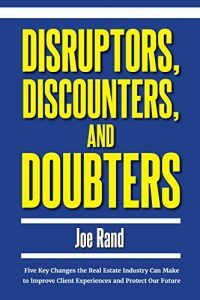 It’s this misdirected focus which, according to Joe, makes the industry ripe for disruption. Joe doesn’t downplay the coming disruption to a client focused business model. He embraces it. He argues that the industry needs to to adopt a customer-focused mindset, or what he calls CORE – Client Oriented Real Estate, as soon as possible. For the industry to make the shift, Joe proposes a team effort among all involved in the industry. It includes the real estate franchises, the brokerages and managing brokers, agents, vendors, and technology companies. Joe’s proposals go beyond generalized observations. He details the steps that the industry needs to take to save itself. Best of all, he does it in a way that is direct and to the point. What I liked as much, or maybe more, than the direct nature of the book is Joe’s conversational writing style. It feels like you’re discussing the state of the industry with him over lunch or an after work cocktail. It makes the book a fast and easy read. 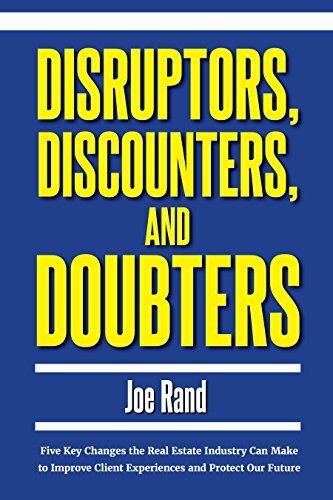 Bottom line, if you work in, support, service, or provide tools and technology to the real estate industry, Disruptors, Discounters, and Doubters is one book that you absolutely must read.